More 1/72 stuff from Scale Aircraft Conversions, this set being for another patrol aircraft, the 1/72 Hasegawa P-3C Orion. This will, of course, fit the EP-3 special boxing if you have that one. 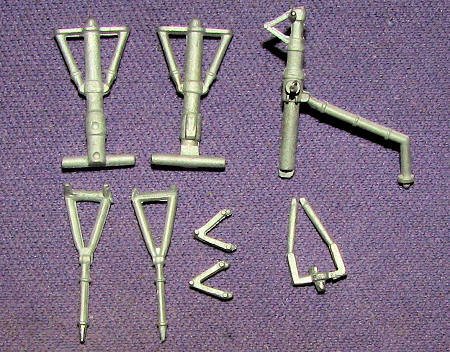 This one includes the two main landing gear struts and a new nose gear, each with the respective retraction strut assembly. Separate oleo scissors for the main gear are also included. The gear is quite well cast and all one needs to do is clean up the mold seams, paint things and install them in place as they are direct replacements for the kit parts. It is not uncommon for cast metal bits to be a bit bent but some careful straightening out will bring them into line once again. You can order these direct athttp://www.scaleaircraftconversions.com if your local hobby shop does not stock them.